Mired in debt, battered by the recession, its car lots stocked with vehicles, the Ford Motor Co.'s future seemed so bleak that the auto giant's long-term survivability was at stake. Yet in 2008, Ford refused to accept the TARP federal bailout money that its rivals GM and Chrysler readily snapped up. Two years down the road, Ford is humming: it's turning in profits and speeding past still-struggling GM and Chrysler as it produces vehicles consumers are clamoring to own. The moral of the story: A smart U.S. auto builder can compete against any competitor, even GM, backed by Uncle Sam. 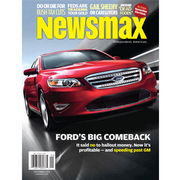 Newsmax magazine's exclusive report, "Ford's Big Comeback," takes an in-depth look at the automaker's amazing rebound under the stewardship of CEO Alan Mulally, a former Boeing executive who is widely hailed as Ford's savior. GM's "elaborate TARP money shuffle"
Will you outlive your retirement money?